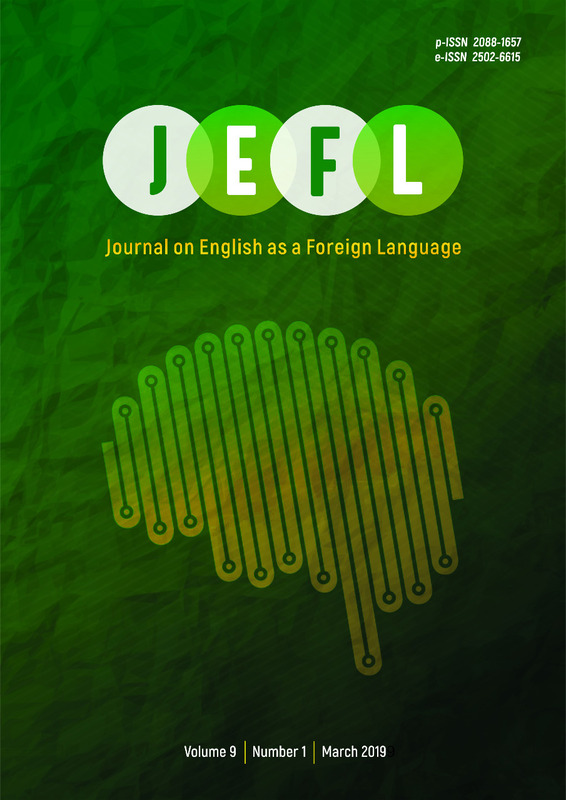 Journal on English as a Foreign Language (JEFL) is a peer-reviewed open-access journal and follows a double-blind review policy. The Journal is scheduled for publication biannually, in March and September, with the first issue to appear in March 2011. The Journal has been indexed on DOAJ since 2016 and ACCREDITED as a scientific journal under the Directorate General of Research Enhancement and Development, Ministry of Research, Technology, and Higher Education (RistekDikti) of the Republic of Indonesia . The Journal calls for unpublished original manuscripts to be considered for publication. The papers submitted to the Journal should not have already been published or are under consideration elsewhere. The manuscript should be 5000-7000 words to be considered for review and follow the Journal style. Guidelines for access to the online Journal can be downloaded here. Before submission, please make sure that your paper is prepared using the JEFL Article Template, and has been carefully checked by referring to the Author Guidelines. The 2nd International Conference on English Language Teaching (INACELT) 2018 is an annual international conference on English Language Teaching (ELT). The theme of the 2nd INACELT 2018 is, English Language Teaching Development in Digital Era: Best Practices, Challenges and Opportunities. This conference will be held on November 16-17, 2018 at Institut Agama Islam Negeri Palangka Raya, Kalimantan Tengah, Indonesia. The 2nd INACELT is hosted by Institut Agama Islam Negeri Palangka Raya Indonesia and organized by the Study Program of English Education Institut Agama Islam Negeri Palangka Raya in collaboration with the Journal on English as a Foreign Language (JEFL). We are pleased to invite you to submit your manuscripts for the upcoming edition of the Journal on English as a Foreign Language (JEFL). Upcoming publication schedules which are still open for submission are Vol 9 No 2 September 2019, and other upcoming issues. Authors must submit their papers via JEFL Website (OJS). Fill in this form to register and use the Guidelines for Access to JEFL Online for online submission.